TV Host and Bucks County native, Jeff Devlin, will join Keystone Opportunity Center for its largest fundraiser of the year next month. 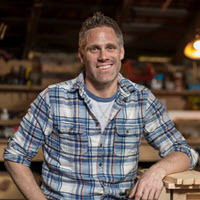 Devlin, owner of SchoolHouse Woodworking, LLC and Host of HGTV/DIY Networks’ “Stone House Revival,” “I Hate My Bath,” “Ellen’s Design Challenge,” and “Spice Up My Kitchen” will emcee Keystone’s Spring Banquet on April 5. Born and raised in Bucks County, Jeff completely renovated two historic Pennsylvania farmhouses. Renovating homes attracted Devlin to Keystone’s mission of housing the homeless, feeding the hungry and educating adults and families in Bucks and Montgomery counties. “I can honestly say that renovating the kitchen absolutely transforms a home and the way people live,” Devlin said during the filming of “Spice Up My Kitchen.” He believes in the legacy we leave behind with every build and the value of what a home means to people. Devlin is proud to support Keystone at its Spring Banquet, which will raise funds to help clients achieve a life of self-sufficiency. The annual banquet features a seated three course dinner, live and silent auctions, and an award presentation. This year, Keystone Opportunity Center will honor community champions—businesses and individuals in the community who helped Keystone assist thousands of families and individuals each year. More information on Keystone Opportunity Center can be found at www.KeystoneOpportunity.org.